I thought I would try multi-hooping in machine embroidery. But I didn’t start with a simple design that might require 2 hoopings. No. Not me. I didn’t even start with a design (as recommended by Amanda from Bernina) with 3 hoopings. Nope. My design requires 14 separate hoopings. What could go wrong? The truth is, it’s a pretty nice design. I used some of the Sepia Petals collection, resized them, wreathed, mirrored and aligned them. The effect is lovely. 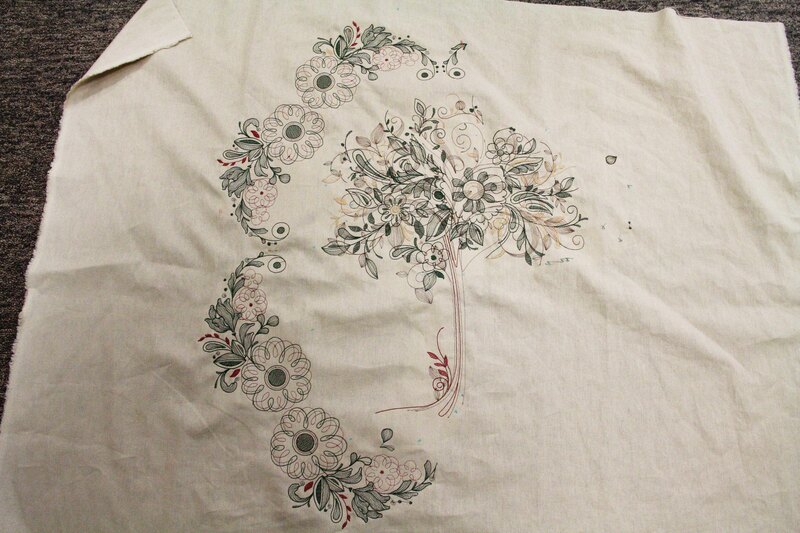 But the design is upwards of 157,000 stitches and measures about 2 ft. by 2 1/2 ft. 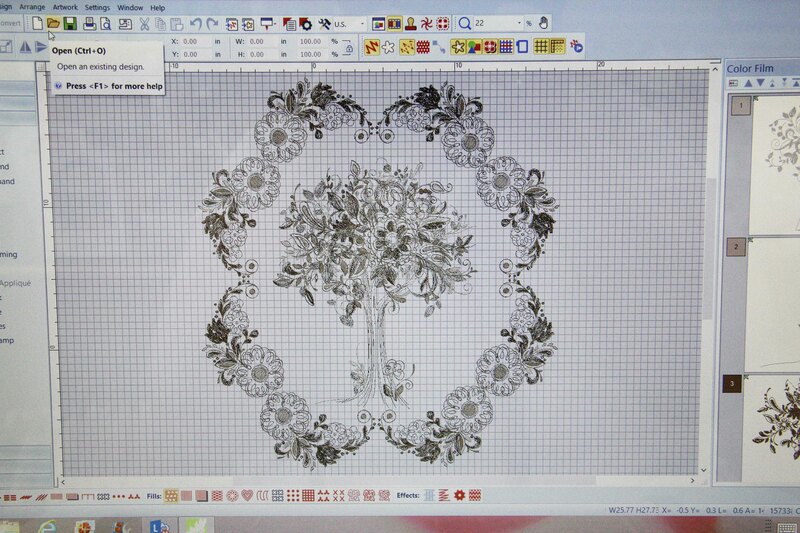 I used the hoop canvas in Embroidery Software 7. When I went to save, it asked me this question: Would you like the export to split the files-one file for every hooping–SHOW ME first. The SHOW ME turned out to be the most critical part of the design. It displays a map of every hooping, in relation to every other hooping. I am only 7 hoopings into this. Needless to say, after about 2 hoopings I was about to abandon the whole project. The registration marks were pulling out. Nothing was lining up properly. But after about the third hooping I began to get better at facing the challenge. 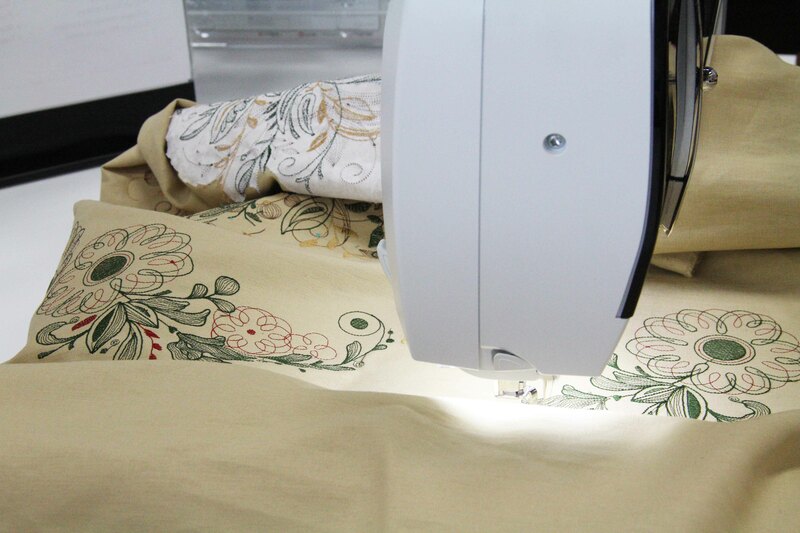 I relied more on the precise positioning on the machine to help me line things up. I got good at keeping the software open and showing the view of the hooping that I was stitching (was this number 6 or number 7??) Anyway, at this point I managed to get the second half of the tree stitched…not yet shown in the pic below, and I am starting to see the light at the end of the tunnel. This pic is obviously a work in progress and I don’t have a final to show you yet. I am planning on adding some coordinating fabric and quilting before I am finished. But at least you can see where it’s headed. Remember, its about a 2 ft. x 2 1/2 ft. design when completed. It hasn’t been pressed in about 3 hoopings. But I think I can make it work. What a learning opportunity this has been! Stay calm and keep stitching. Amen to that. I’ll share when it’s done. This entry was posted in art, Creativity, digitizing, embroidery, machine embroidery, sewing and tagged machine embroidery, multi-hooping by edges. Bookmark the permalink.